I went to the movies alone this past weekend. Well, my friends were technically in the same building, but they chose to see “Saving Mr. Banks.” When I learned that the fifth Paranormal in the series was coming out, having seen the other four, I opted to see that instead. I was ready to take my independent-woman status to the next level by seeing a movie alone–and a scary movie at that. The Marked Ones follows a few high-school graduates: Jesse (Andrew Jacobs), Hector (Jorge Diaz), and Marisol (Gabrielle Walsh) who, after the death of an elderly neighbor they suspected of being a witch, experience a variety of disturbing and supernatural events. As is typical to the Paranormal movies, it’s filmed from the perspective of a camera carried around by one of the main characters. The first criticism I have is that the shaking and erratic handling of the camera in this movie made me extremely nauseous. I found myself having to tilt my head to either side or close my eyes at some parts–not because of fear, but because I felt I might throw up. I would have appreciated a more equal balance of a stable camera and a shaking camera. All of the actors in the movie did a fine job–they were believable and realistic. I definitely felt like Jacobs and Diaz adequately captured the essence of a teenage boy, if such a feat is possible. Walsh is also a good supporting character. This is not a bad movie, but it’s not as scary as it is being made out to be. I just remember seeing the advertisements for this movie featuring faces in the theater, twisted in fear, mouths gaping at the horror that was filling the screen. They worked, because I saw the movie. But I couldn’t help but wondering after if they had seen the other movies. Yes, there are the scary looking demons, the jumps out of nowhere, the creepy behavior we have seen in the other 4 films. I hate to say it, this movie is no crazier, no scarier, and no more shocking than it’s predecessors. 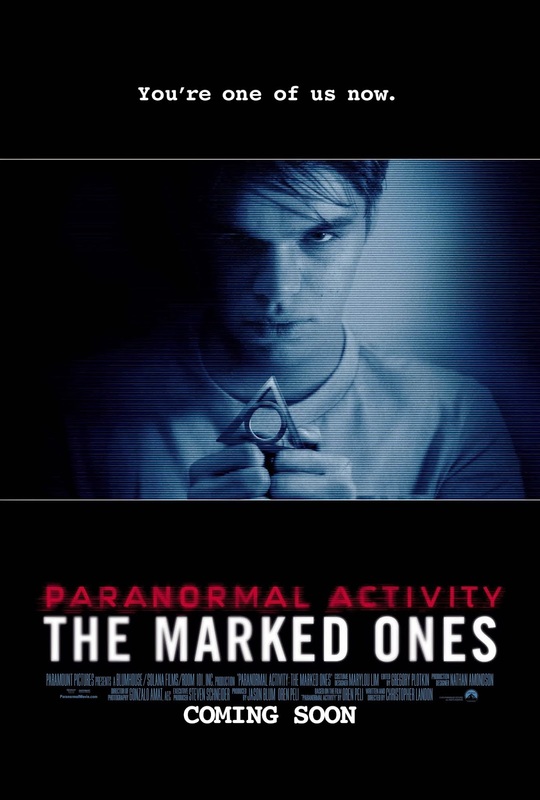 In fact, I would say that The Marked Ones was more funny, than scary. If you take out all the screaming, it could have been a comedy. I was laughing but a little disappointed. So, should you see Paranormal Activity 5 this weekend? If you’re a fan, go for it. But don’t expect it to be different, or more scary than the others. You may want to just Netflix this one. Previous I have a big chin, and that’s fine. I saw this this weekend too! I was rolling my eyes the whole time which is my own fault for expecting it to be super scary. Now that I look back on it a bit it wasn’t too bad. At least I didn’t have to pay for it. LOL! Good review Megan. You can tell that they are really trying to do whatever it is that they can to keep this franchise alive and well, and while this may not be a total disappointment, it’s still pretty obvious.